This is a Wholesale Lot of 72 units. Each unit comes in an individual peggable clamshell with a full-color retail card, as pictured. Comes in a retail display box of 12 units. Retail Display Temporarily NOT Available! There are 6 dozen (72 units) per inner box; 4 inners (288 units) to a full case. No display boxes. Amazing Flashing Teeth LED Blinking Mouthpiece. Putting a mini glow-stick in your mouth is so 1990s... Enter the high tech age with the battery-operated Multi-Glow Flashing Mouth. Awesome multi-colored LEDs will make your smile truly beam! 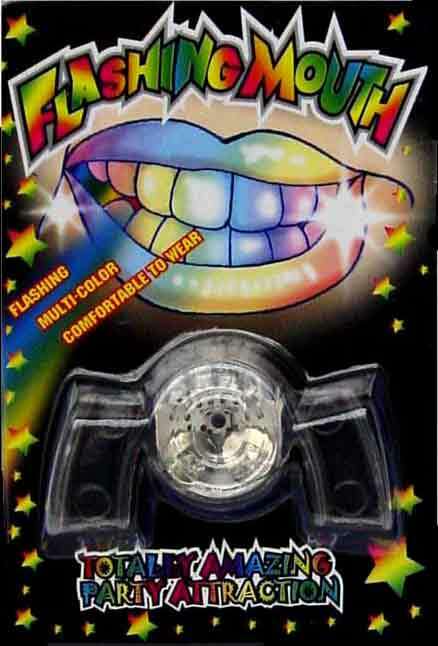 The rubber Multi-Glow Flashing Mouth sits comfortably in your mouth over your teeth and fits most teens and adults. For your safety, batteries are not replaceable. Just push on or off; hand-washable and reusable. Be the life (and the LIGHT) of the party as you dance with the Flashing Teeth LED Blinking Mouth Piece! This is the Hottest, Coolest Novelty to come out in some time! Simply press the button to turn the unit on, then insert the unit into your mouth. The Flashing Teeth Guard Blinks in Alternating Colors! Soft rubber unit fits comfortably into the mouth. What also makes these so cool is that you will not see it in your mouth, so it looks like the flashing is coming through your teeth! Perfect for Raves, Partying, Halloween, Concerts, Dancing, and More! Super Bright LED Lighting, Dazzling Flashing Effects! Batteries are preinstalled and for your safety are not interchangeable. Non Toxic Rubber Unit is Completely Safe for use. No more dangerous chemical Glow-Sticks in your mouth! This Cool Light Accessory is Great with Music!